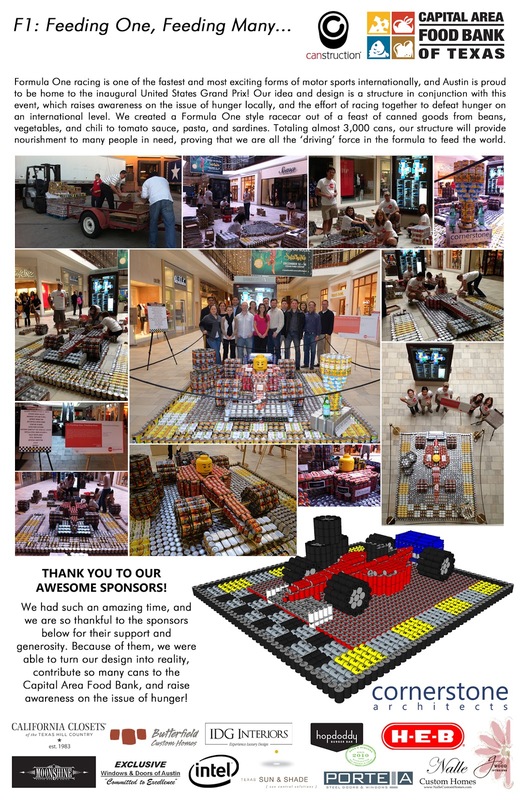 With the F1 United States Grand Prix kicking off today, and the Canstruction displays drawing to a close, now is the perfect time to head out to Barton Creek Mall to see our F1 racecar made of cans! You have until Sunday at 6pm to go check it out. If you feel so inclined, you can even vote for us to win the online favorite here! We had SUCH a fun time...from the initial planning stages, to loading up the thousands of cans and delivering them to the mall, to finally working together as a team to bring our design to life! We were honored to be a part of such a great event, and to all of those who supported us in the process...THANK YOU!!! Canstruction is using one can of food as a catalyst for change. One Can® to represent the building blocks of massive sculptures. One Can® to prove that every act of kindness makes a difference. Since 1992, Canstruction has contributed over 17.5 million pounds of food to community food banks demonstrating that we can win the fight against hunger. Competing teams, led by local architects, engineers and builders showcase their talents by designing and building giant sculptures made entirely of canned foods. At the close of the Canstruction exhibition, all of the food used in the structures is donated to the Capital Area Food Bank of Texas. Cornerstone Architects is excited to be competing in this event! 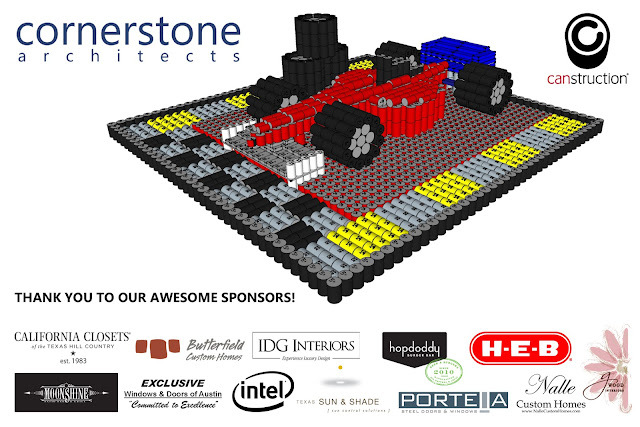 Our team is building this Saturday from 8:00a to 4:00p at Barton Creek Mall. We will be out in front of Nordstrom on the lower level if you want to come by and check it out! The structures will remain on display in the mall for a week before they are taken down on Sunday, November 18th. In light of the inaugural Circuit of the Americas United States Grand Prix coinciding with this event, our team will be creating a Formula 1 style race car completely out of cans! Another Halloween, another Cornerstone Costume Contest! This year, Carolyn took 1st place for her Human Rubick's Cube! Can YOU figure her out?? Annalee came in 2nd as the Geisha Girl, and Pam got 3rd place as the most adorable Tootsie Roll ever :) Honorable mention went out to everyone else who participated! We had a great time, and were able to entertain some clients in the process!